The season is certainly upon us and everyone seems to be in the spirit this year. The stores are crowded, there is an upbeat festive fervor that fills the air and the only downside is the traffic and challenging parking situations – a small price to pay! I don’t usually post current articles from magazines but this month’s Connecticut Cottages and Gardens contained such a perfect seasonal feature, I couldn’t resist. Not far from me in the neighboring town of New Canaan, sits a classic 18th century white clapboard home owned by interior design Susan Oster and husband Hank. Set on 5 acres, this old house was made for the holidays. 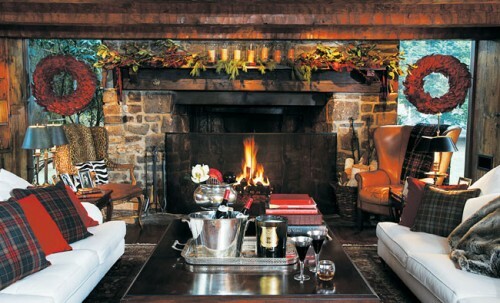 The original fieldstone fireplace is the perfect backdrop for Christmas decor. Classic tartan, red wreaths and silver accoutrements set the stage for a perfect at home celebration. 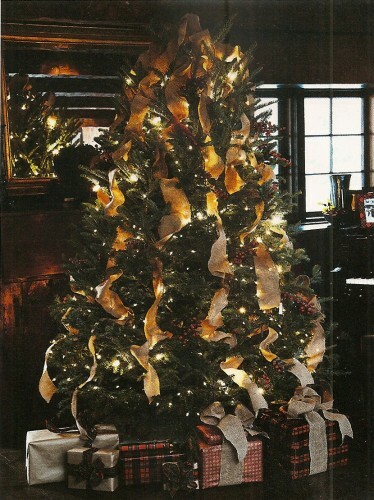 A simple classic tree with burlap ribbon and white lights is all you need in this setting. 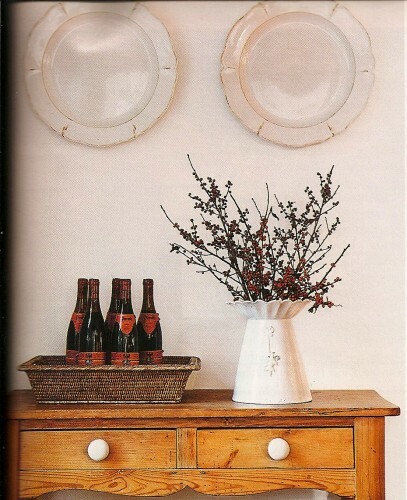 or these antique silver vessels with natural green and white arrangements. 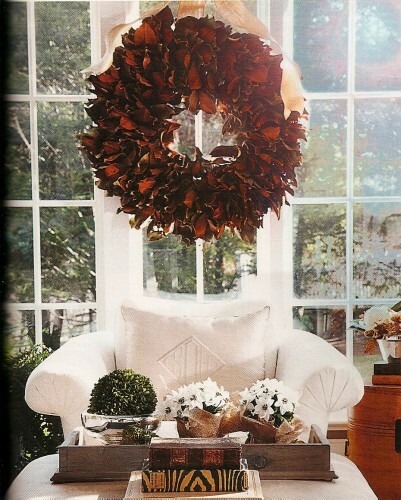 The sunroom offers Christmas cheer with a red wreath against the linen arm chair. Even a late 18th century oil gets adorned! 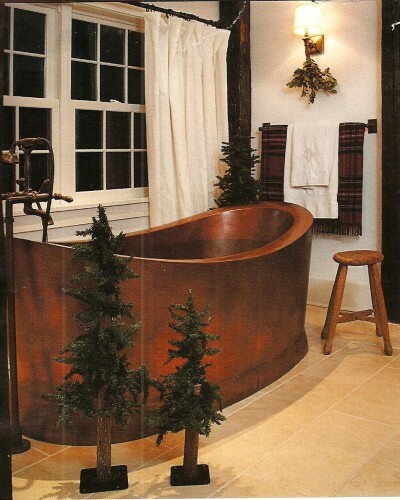 I don’t think I’d even mind the snow knowing I could relax in this fabulous copper tub looking out over the property. Here’s hoping this serves as a little inspiration during your holiday preparations!! This entry posted in architecture, interior design. 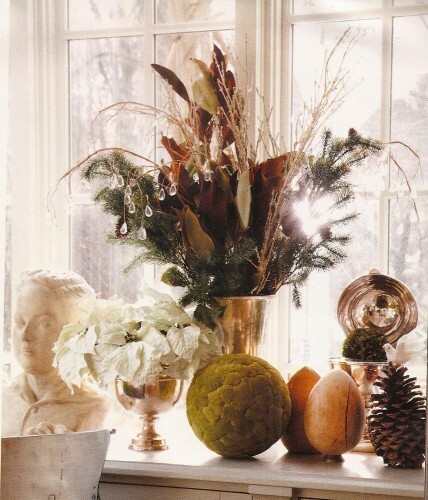 Entry Tags: Connecticut Cottages and Gardens, Holiday Decorations, interior design, Susan Oster Bookmark the permalink. There is nothing like Christmas in Connecticut! I haven’t done any decorating yet at all! : o Taking it easy this year. So thanks for the great ideas, Stacey! Absolutely picture perfect in every way. Absolutely. Finding inspiration and joy amidst the holiday hustle and bustle is what the season is all about. Hope you are taking time to enjoy a moment, that tub would be heavenly to recharging one’s engine! What a sweet spot. Love that magnolia wreath. Loved this spread too and my fingers are crossed for a white Christmas! 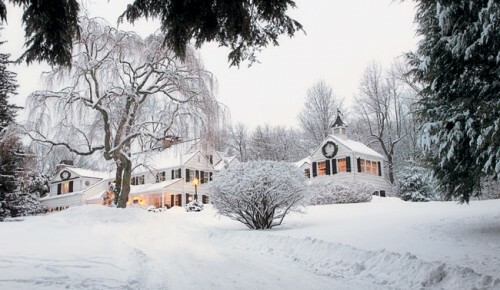 I love it looks like Christmas in New England for sure, beautiful home! I too loved this feature, although, I must confess…every day without snow so far, seems like a gift to me, in the minority here, but fingers crossed for a very mild winter! Oh what a winter wonderland type of house! Enjoy the festive season dear! Thanks for featuring, us out of towers would have never got to see this delight! Think I could live in that house no matter what season of the year! Is it for sale??? The first picture would make me want to buy it on the spot, sight unsceen! The beautiful interior was a bonus, thanks for a lovely holiday tour! That tub. Oh my. What a gorgeous home, perfectly decked out. Thanks for posting this Stacey, I would have missed it otherwise! This post is amazing! Such beautiful and warm rooms, and the tub is calling my name. So beautiful. I hope that you are having a nice season, and thank you for the lovely posts that we have learned to count on. The bath in that last image is pure bliss! The first snowy image sucked me in and then to top it off with that tub?! Incredible!!!! 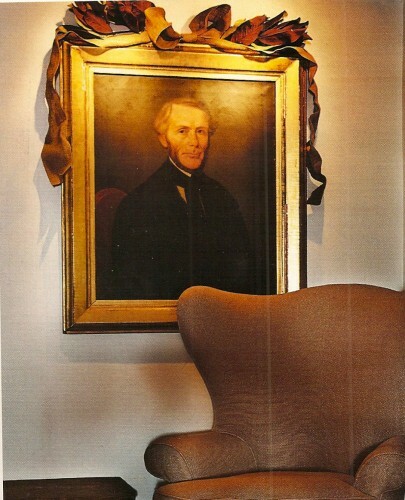 absolutely love these images, especially the portrait with that gorgeous brown ribbon-genius! Stacey what a glorious home and property!! A truly gorgeous setting! More wonderful Days of Holiday Giveaways! You will love the unique gifts that have been added! I read this article in the magazine sitting in awe of the first image. Does that not look like the most ideal place to celebrate the holiday season? Super lovely home. It feels inviting and warm. Hope your holiday season is off to an amazing start. XOXO. Hope you are enjoying the holiday spirit Stacey!